Seems like serving a wine should be easy enough: Just open and pour. But anyone who has ever struggled with a crumbling cork, or listened to a debate over whether the Cabernet they’re drinking needs to “breathe” more, knows that sometimes it’s not quite so simple. Ever been handed a fine wine in a chunky water tumbler, a tiny glass or a plastic cup? You may have noticed that you’re just not picking up any nuances; it’s not you or the wine, it’s the vessel. Not everything that holds liquid is well-suited for wine. Glassware is extremely important to wine appreciation—it influences how you perceive the color, aromas and taste—so the quality is absolutely key. Fortunately, there are many wine-friendly options on the market so you can find a glass that’s right for you—one that balances aesthetic appeal with what you can afford and how much space you have in your cupboards. In general, look for clear crystal with thin-rimmed, large bowls that hold 10 to 18 ounces, taper slightly at the top and balance well in the hand. The clearer the glass, the richer the wine’s color appears. The thinner the rim, the less the glass distracts from the wine as you sip. A large bowl and a narrow opening (but not too small to drink easily from) help magnify the wine’s aromas, providing plenty of space for the aromas to expand, but little room for them to escape. Many glasses are too small; few are too large. Hand-blown glass is generally thinner, especially at the rim, and balances better than machine-made glass. These days you’ll find quite a few “combination” wineglasses with hand-blown bowls and machine-made stems and bases. They can be a good compromise between beauty and cost. Wineglasses traditionally have stems so that your hand doesn’t touch the bowl, obscuring the glass with fingerprints or warming the wine above proper serving temperature. However, these days, stemless glasses have become popular because they are easier to store if you have limited space, are dishwasher-friendly and less prone to breakage without the fragile stems. Many wine lovers find an all-purpose, everyday wineglass that does the trick for them. The next step up would be to get an all-purpose red wine glass, an all-purpose white wine glass, and some Champagne flutes. Generally, red-wine glasses have larger bowls and wider openings than those for white. Sparkling-wine glasses should hold 6.5 ounces or more and be either narrow and tall to channel the bubbles in a continuous stream or tulip-shaped with a narrowing at the rim to better trap the aromas and bubbles. If you drink dessert wines, glasses for Sherry and Port traditionally are small, because those fortified wines are usually consumed in small quantities. 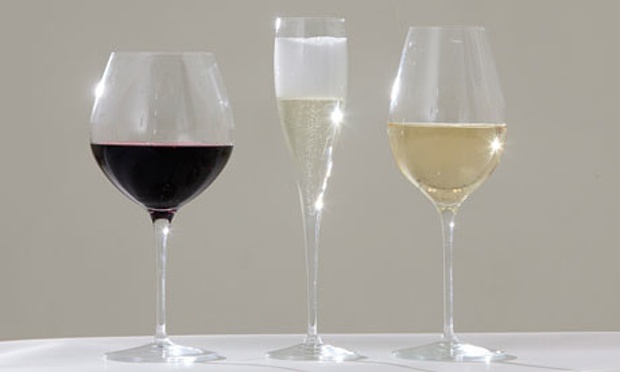 A single quality glass can be used for reds, whites or rosés; just be sure not to overfill when serving. If it’s within your budget and space to expand from there, there are also wineglasses that are designed to showcase specific types of wines—say, one for Pinot Noir that’s different from one for Cabernet-based wines. The sizes and shapes of the bowls influence the intensity and complexity of the aromas, while the shapes of the rims determine where the wine initially lands on the tongue, affecting the perception of its taste. They’re certainly an indulgence, but if you try a side-by-side taste test with these differently shaped glasses, you can see how much they influence the way a wine tastes. Whatever you choose, it’s best not to fill a wineglass more than half full. (Flutes for sparkling wines—which you don’t have to swirl, because that dissipates the bubbles—are the exception.) You need to leave enough air space to swirl and release the aromas. Don’t worry about looking stingy with your pours in front of guests; now that you’re serving your wines in perfect condition, they should be getting twice the enjoyment out of every glass! PUBLISHERS NOTE: This feature compliments of Wine Specator. Please check them out online and become a member so you can offer your comments! To protect the quality of the conversations, only members may submit comments. Member benefits include access to more than 315,000 reviews in our Wine Ratings Search; a first look at ratings in our Insider, Advance and Tasting Highlights; Value Wines; the Personal Wine List/My Cellar tool, hundreds of wine-friendly recipes and more. Thant you for this article !